The last four months have been a wonderful experience, I think coming to the Math in Moscow program has given me so much exposure to mathematics and culture that I don’t have access to back home and I definitely recommend anyone considering applying to go through with it and make the most of this special opportunity. These four months have opened my eyes to many areas of math I had never heard of: representation theory, smooth manifolds, and a lot of discrete math. I also became acquainted with many things I had only heard of. I will always have happy memories of my time in Moscow. Спасибо за все, мы все так много выучили! This semester is really an unforgettable experience for me. Educated in China for my high school I’ve been admiring the Russian style since I was young. The emphasis on problem solving is particularly attractive for me. Also, the living conditions are incredible with a very low price. Moscow is a great city and I hope I can come back in the future ! The past four months have been both mathematically & personally rewarding for me – I don’t think that such an experience would even be completely available to me in the States. The community of mathematicians I’ve met here – both professors & participants has been both encouraging & enlightening. I’ve made lasting friendships & learned an absolutely ridiculous amount. I’ll be sad to leave but I’ll remember this program forever. I truly feel that I am a different mathematician than I was in January – more mature, more independent, excited for new types of research. Moscow is a gorgeous, intricate, complicated city: who could be bored ? Many thanks to all of the friendly, caring professors, dorm staff, Irina, Elena, and Moscow in general – with luck, I will be able to visit again someday ! I’m forever grateful for my time here. I’ve grown a lot – personally and mathematically. Before coming here, I was not putting very much priority to my mathematical studies. Being around so many motivated students and professors has given me the inspiration to push myself as far as I can go. Honestly I was not looking forward to the end of the semester because it means that I will not see a lot of the people here for along time, but I’m also more excited than ever to continue learning and improving, and potentially seeing my old classmates in future conferences. This semester was one of the best experiences of my life. I really enjoyed my classes – I think all my professors were fantastic, and since math people have been one of the biggest parts that draws me to math, meeting professors with such charming and interesting personalities made my math experience great. In this sense, it was also great to have Xindi Ai as my roommate, since she was a lot more exposed & a lot more experienced than I am. Living with her and with so many math students certainly helped me learn a lot, and it was nice to have so many people with similar interests. Even almost all of the courses that I’ve taken differ significantly from courses at my home university – most of them are not even offered back home. The learning I’ve received this semester also seems to have prepared me much better for my research program this summer. I also loved being in Moscow & through many Russian cities like Sergiev Posad, Petrozavodsk, Vladimir and so on. I really like how cultured the city & the people are, and how there are countless opportunities to listen to the philarmonic/orchestra, watch plays & ballets & I think it makes a big personal difference to have these opportunities in one’s youth. I can’t thank prof. Irina, the organizers, my professors and my classmates for this. It has been the best experience of my life. I suggest everyone who actually wants to do math to come here. It is a totally different experience compared with the one I had in the US – the way that people do and teach math, the city, Russian people, etc. I love Moscow and I hope that I would be able to come back again. This was an absolutely wonderful and life-changing experience. Leaving the microcosm of my home university, I was exposed to math I have never heard of as I worked at school, in the dormitory, or on my own in cafés. I wish every serious student may have the chance to learn here, and to be a part of this electrifying community. What a wonderful experience ! I came here expecting interesting courses, but the beauty of the math and the fellow students surpassed my expectations. There are many experiences I will never forget, and I am grateful for everyone here, students & professors alike for such an amazing time. This was an incredible semester. I decided to take courses in areas with a long Russian tradition that wouldn’t be available at most colleges in America, and it was a fascinating experience. The professors were not only knowledgeable about the subject, but were students and collaborators of the mathematicians whose names kept appearing with theorems we learned in class. Being so close to the creative origins of beautiful mathematical subjects is an experience I will remember and try to replicate for the rest of my life. 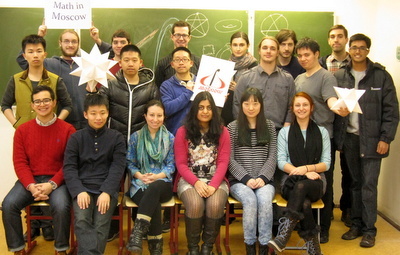 Math in Moscow is a wonderful program that I would recommend to anyone seriously interested in mathematics.